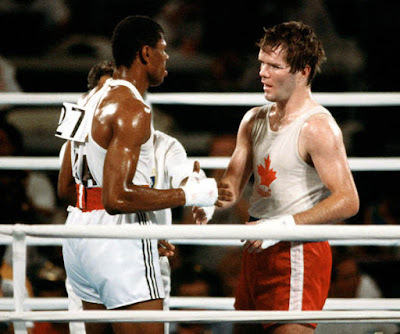 Shawn O'Sullivan, at right, one of Canada's greatest Olympic boxers. A few days ago I got a message from my cousin. He was watching the Olympics in Rio and asked me which ones we watched together as kids: was it 1980 or 1984? It was in fact 1984 when they were held in Los Angeles. What made it extra special was my cousin, along with another cousin, had just returned from a church trip to – Los Angeles. That simple message brought a whole cascade of memories of that magical summer of 1984.
their quest to be the best, could bring honour and glory, to their country. It was a Saturday afternoon back in the days when CBC Sportsweekend was a weekend staple. They were airing an amateur boxing bout featuring two light-middlewights. 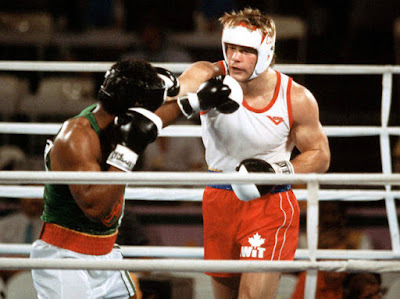 The focus of attention was Shawn O’Sullivan of Toronto, who had won the 1981 amateur world championship and the 1982 Commonwealth Games gold medal. He easily won that fight and would be featured several times leading up to the 1984 Olympics. He was favoured to win gold in Los Angeles, especially with the looming spectre of a boycott of the Olympics by Communist countries including boxing powerhouse Cuba. Willie de Wit, at right, another great Canadian Olympic boxer. At about the same time, in the heavyweight division, another Canadian was making his mark, winning the 1982 Commonwealth Games gold medal and 1983 world championship. He was mentioned in that first bout I saw of O’Sullivan’s, because he too was an amateur world champion. His name was Willie de Wit and he was from Grande Prairie, Alberta. Like O’Sullivan, he was favoured to win gold at the upcoming Olympics. 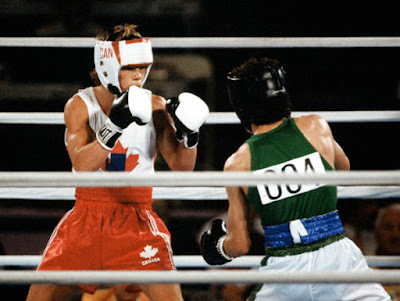 As the Olympics got closer, Sportsweekend was showing the fights of another boxer –bantamweight Dale Walters of B.C. He was so much smaller than de Wit and O’Sullivan, but was so tenacious. He went straight after his opponent, and never left him alone. He was pegged as having an outside chance at a medal, but nowhere near good enough to challenge for gold. So there was reason for optimism Canada could win three boxing medals, with a good chance of two of those being gold. Dale Walters, at left, won Canada's first Olympic boxing medal in 52 years. I was a traveller that few weeks in 1984. I was on the farm when the Olympics started, spent some time in Brooks, back to the farm, then a weekend at my brother’s in Calgary, and back home where I saw the closing ceremonies from the comfort of our couch. The first medal was earned by Walters. He drew a first round bye then won his first three fights. He looked good, but the best fighters were yet to come. Walters, using that bulldog style, had advanced to the bantamweight semi-final guaranteeing himself a bronze medal. The organizers felt there was not enough time to hold bronze-medal matches so both losers of the semi-finals in each division were awarded a bronze medal. That was good, because Walters lost his semi-final to Mexican boxer Hector Lopez. 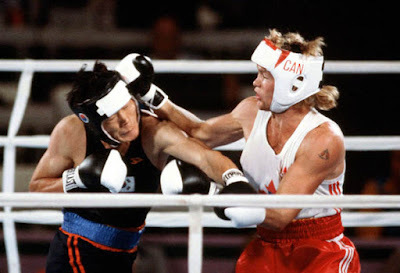 Still, Canada had its first medal in boxing in 52 years. It was in Calgary when the two gold-medal finals happened. Willie de Wit was fighting in the afternoon while we were doing some shopping. O’Sullivan was set to fight in the later afternoon, or early evening, and I made sure to be in front of the TV in my brother’s basement to watch. Anyway, as I settled in, my brother came downstairs to get something, and broke the news. “De Wit won silver eh?” he said. At that point, I didn’t know he had even fought yet, so part of me didn’t believe him. Yet, in the lead up to the O’Sullivan fight, they mentioned de Wit had lost to American Henry Tillman who claimed gold for the U.S. Yet, there was still O’Sullivan. Every time I had watched him fight, he was impressive. He seemed to be able to take a punch as well as he gave one, and never seemed to panic. Awaiting him in the gold medal final was another American, Frank Tate. I had an uneasy feeling in my stomach. De Wit had lost, proving there were no sure things. O’Sullivan did not look that impressive in the first round of the gold medal final either. Then he rebounded in the second round. He went after Tate, landing enough punches to force Tate into two standing eight counts. A third was imminent when the round ended. Things looked good for O’Sullivan, and Tate seemed to be reeling a little bit. Yet, after a third round that went back and forth, the judges gave a unanimous decision to Tate. Unanimous. Even after that dominating middle round by O’Sullivan, they said Tate won all three rounds. A lot of fans booed the decision. After so much promise of gold, Canada settled for silver twice. However, my initial disappointment soon turned to pride. Canada had won two silver medals, and a bronze. That was incredible given we had won no medals in boxing since 1932. Wayne Gordon, at left, gave the best amateur in the world all he could handle. 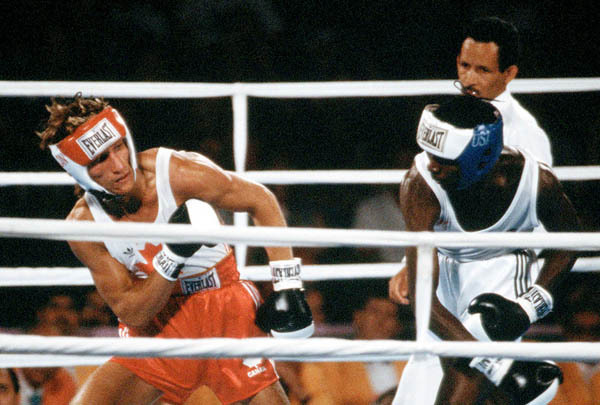 There were other notable boxing moments in the Olympics. Welterweight Wayne Gordon was another solid competitor with the worst possible luck. I actually caught a few of his fights on Sportsweekend too, and he looked like a medal possibility. He had been elected captain of the team by his peers, only to discover he had drawn Mark Breland, the world’s best amateur fighter. Breland had won more than 100 fights and was considered a heavy favourite to win gold. I missed this fight while I was in Brooks, but Gordon came out and gave Breland all he could handle. At one point he got in a couple shots and forced Breland to take a standing eight count. I just watched it on YouTube and Gordon was tough. However, Breland was the best for a reason. He rebounded and took control in the third round to win the match on points. Not only was Gordon a winner too for going the distance with Breland, but he actually put a scare into the champ. They were still talking about his fight days later when I started tuning into boxing. Lennnox Lewis fought in 1984, but his best was yet to come. Another memory comes from an 18-year-old fighter competing in his first Olympics as a super heavyweight. He gave it all he could but came up against Tyrell Biggs, the eventual Olympic champion, in the quarter-finals. This young Canadian fighter's best years were yet to come though. He would stay amateur and win Olympic gold in 1988, then have a distinguished professional career retiring as undisputed heavyweight champion. His name was Lennox Lewis. Finally, there was someone close to home. Lethbridge boxer Rick Duff, whose career we followed on peasant vision's Channel 7 and 13, represented Canada in the middleweight division. He won his first fight then lost in the second round to the eventual gold medal winner from South Korea. Duff still lives and coaches boxing in Lethbridge. He even coached a friend of mine recently. Rick Duff, at right, was from Lethbridge, boxing as a middleweight. Most of these boxers turned pro. I followed the exploits of O’Sullivan and de Wit, who had differing degrees of success as professionals. I saw a lot of O’Sullivan's fights on Sportsweekend and later TSN, I think. He won his first 11 fights, but then lost to Simon Brown, who would go on to win the IBF welterweight title. I recall seeing that fight and being so disappointed. O’Sullivan also injured his hand and was never quite the same. The last O’Sullivan fight I saw was in my first year of university in 1987, which he won. By then, Sugar “Ray” Leonard had joined his team to coach him. One of my friends even joked it was one of the few times when the coach could tell the student what to do, and actually do it better. O'Sullivan would go on to lose fights to Luis Santana and Donovan Boucher, and retired soon after in 1988. De Wit had a much different career. What I recall most was him winning some pro fights, including a defeat of one-time Canadian champion Ken Lakusta, and winning the Canadian heavyweight title. Then he faced a killer in “Smoking” Bert Cooper. One of my classmates, named Mike, loved Cooper and said he could be the next heavyweight champion. He would go on to destroy de Wit. The night of that fight, I went to a basketball game at Kate Andrews and my principal was there. He lamented de Wit’s loss, describing one punch he took as “making his nose explode.” Cooper had already defeated gold medallist Henry Tillman, now adding a win over the silver medallist. In an interview I saw later where the interviewer mentioned that, Cooper said he wanted to win the “world medal” alluding to the heavyweight championship. He would later be touted as a legitimate threat to Mike Tyson who was laying waste to every heavyweight in his path. Yet Cooper never did win that championship. Meanwhile, de Wit would re-group, winning his last six pro fights, including another win over Lakusta. De Wit’s last pro fight, fittingly, was against Henry Tillman. He exacted a bit of revenge for the Olympic loss by winning the fight in a decision. He retired soon after that. In the years after, I sort of met Willie de Wit. After his boxing career ended, he went to law school at the University of Alberta. My friend Shane Saunders was in his class. As second semester ended in the 1991-1992 school year, the law students all went to a pub called “The Library”, which we also frequented. When we got there, the place was packed, but the figure of Willie de Wit was unmistakable, towering over everyone. He was a foot taller than most people, and his head looked like it floated over the crowd. I actually said hello to him on my way to the washroom. That was my brush with greatness. The last time I saw him was when I was in journalism school in Lethbridge in 2000. We went to the courthouse as part of our unit on court reporting. Sure enough, who comes out of the courtroom in full black robes – Willie de Wit. He was just as big and imposing as ever. It was obvious he had moved on. So often athletes live in the past, trying to relive their glory days. Often they stay connected to their sport either coaching, managing or organizing. Willie de Wit did the opposite. He seemed to have his sights set on the future and his new career. 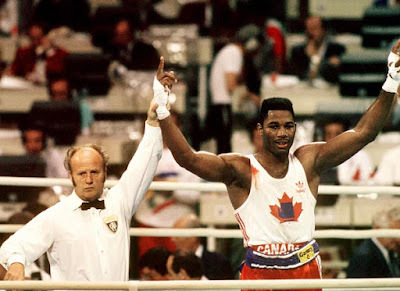 In the end, Shawn O'Sullivan Willie de Wit, Dale Walters, Wayne Gordon, Rick Duff, and Lennox Lewis epitomize the true spirit of Canadian sport. O'Sullivan and de Wit were both gracious in defeat, and carried themselves with class. Walters restored Canada's pride in the ring, winning the nation's first medal in 52 years. Gordon showed that against insurmountable odds, and a daunting opponent, all you can do is your best. Duff came from the same part of the world as me, proving the Olympics weren't some far off dream, but something within reach of anyone who just works hard enough. And Lewis showed that even if you don't win, if you press on and persevere you will be rewarded. What is more Canadian than that?